TimeTrak’s Model 900 Proximity Badge Series data terminal is the latest in our line of Innovative Smart Terminals featuring MS-Windows embedded, offering an expanded array of time & attendance transactions types required in today’s dynamic, data-driven work environments; especially labor transfers between departments, jobs, cost centers, and task codes. 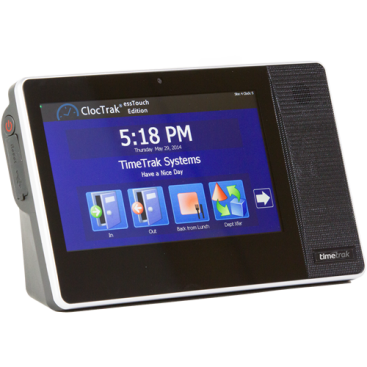 The Model 900 also provides employee self-service benefits to your entire staff – both hourly and salaried – including ‘live’ access to labor hours and details, PTO balances, schedules and time card information including history. 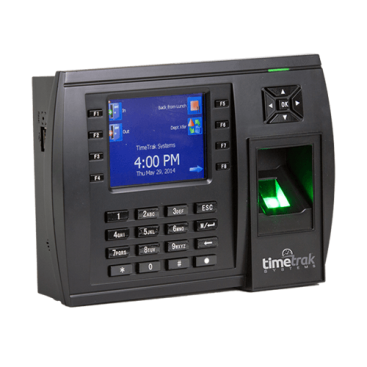 These attractive & versatile terminals offer easy integration with internal or external badge readers, even when used in combination with the biometric finger reader, providing a balance of unparalleled performance and ease-of-use for your staff, using the latest advanced algorithms for biometric validation for consistency, speed, and precision.